Collection of photographs of Camperdown Mill and community from the SC Room Archives. 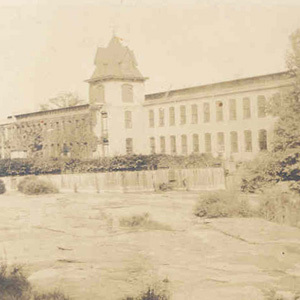 Camperdown was the first “modern” textile mill to be opened within city limits. Organized by Oscar Sampson, George Hall, and George Putnam in 1873, it began operation in the old Vardry McBee Mill, but was later expanded to a second building built across the Reedy River. The mill changed hands several times over the years and ceased operations in 1956. The mill was torn down in 1959; the foundations of the buildings and mill race remain visible in Falls Park.